Our experienced rehabilitation team is committed to providing outstanding results and excellent quality of care. 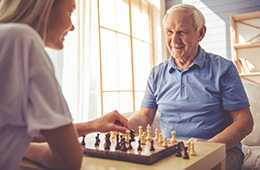 Residents are empowered through individualized programs to reach goals of increased strength, independence, and ability. Resident families are encouraged to participate in therapy sessions, caregiver education, and training. We offer out patient therapy services so that our patients are able to continue to receive care with their same therapists from the time they are admitted to our facility and through coming back for follow up care with the same therapy team. Our physical therapy team works toward specific goals of achieving the resident’s highest functional level of independence. Physical therapy focuses on assessment and rehabilitation of individuals with physical impairment and pain, as well as future injury prevention. Following evaluation, our experienced physical therapists develop an individualized treatment program.